This sweet little bird is a quick knit, and doesn’t use much yarn so is super for a stash-busting project. TECHNIQUES: All pieces are knitted flat (back and forth) on a pair of straight knitting needles. You will need to cast on and off, knit, purl, work increases and decreases, and sew seams. 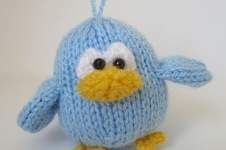 The bird’s head, body and eyes are all knitted in one piece (the eyes are knitted bobbles and instructions on how to knit a bobble are included in the pattern), and the beak, feet and wings are knitted separately and sewn in place. The wing pattern incorporates a three needle bind off. FINISHED SIZE: The bluebird is approximately 5.5cm wide (not including the wings) and 7cm tall (not including the top loop).